Spread the word and help keep our lake protected from aquatic invasive species!! Unintentional introductions occur when invasive species are transferred accidentally. For instance, zebra mussels can be spread when ballast water used for ship stability is exchanged. Several aquatic invasive species have been identified in our lake. It's up to us to help stop the spread of these invasive species to other bodies of water. Zebra mussels are small, fingernail-sized animals that attach to solid surfaces in water. Adults are 1/4 to 1-1/2 inches long and have D-shaped shells, often with alternating yellow and brownish colored stripes. Female zebra mussels can produce 100,000 to 500,000 eggs per year. These develop into microscopic, free-living larvae (called "veligers") that begin to form shells. After two to three weeks, the microscopic veligers settle and attach to any firm surface using tiny fibers called "byssal threads." Zebra mussels are native to Eastern Europe and Western Russia and were brought over to the Great Lakes in the ballast water of ships. Populations of zebra mussels were first discovered in the Great Lakes in 1988.
clog irrigation intakes and other pipes. Zebra mussels also can impact the environment of lakes and rivers where they live. They eat tiny food particles that they filter out of the water, which can reduce available food for larval fish and other animals, and cause aquatic vegetation to grow as a result of increased water clarity. Zebra mussels can also attach to and smother native mussels. Yellow floating heart has been identified at nearby water bodies, such as Lake Carl Blackwell, and are threatening to infiltrate Lake McMurtry. It's extremely important for boaters coming from Lake Carl Blackwell and going to Lake McMurtry to follow the boat washing guidelines listed below. Stem/Roots: Nymphoides peltata is a rooted, perennial species with long branched stolons (up to 2 meters) that lie just below the water surface. Multi-leaved "plantlets" are produced at the nodes along with roots. 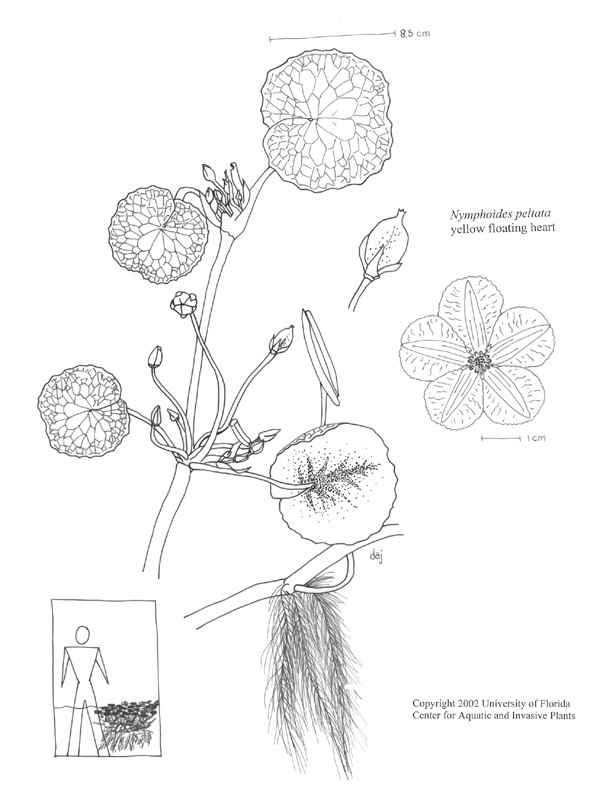 Leaves: Leaves are floating, round to heart-shaped (cordate) (3-12 cm in diameter) which resemble those of waterlilies (Godfrey and Wooten 1981; Newman 2000). Leaves are green to yellow-green and have slightly wavy margins. Undersides of leaves are often purple. Flowers: Two to five bright yellow, five-petaled flowers (2-4 cm in diameter) arise from each node as simple umbels with shallowly fringed petals borne above the water surface. 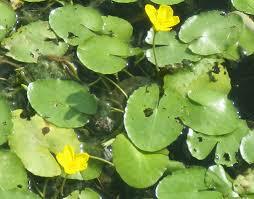 Plants flower between May and October depending on water temperature. Nymphoides peltata can form dense floating mats of vegetation that block sunlight from reaching native plants and algae. Depending on the extent of the yellow floating heart population, the algae population could decline and disrupt the food web. The reduction in native plant species degrades the habitat and may reduce access to food for fish and wildlife. If the population of yellow floating heart is large enough, fish and other wildlife may be forced to relocate. Dense stands of N. peltata can cause slow-moving water to become stagnant and the water beneath the mats to have a low oxygen concentration. Dense surface mats of N. peltata can hinder the air exchange between the water’s surface and the atmosphere. These areas of stagnant waters can be an ideal location for mosquitos to breed. Lake McMurtry Is equipped with boat washing station in both recreation areas. DRAIN watercraft bilge, livewell, motor and other water containing devices before leaving water access. DRY everything for at least five days OR wipe with a towel before reuse. DISPOSE of unwanted bait, worms, and fish parts in the trash. When keeping live bait, drain bait containers and replace with spring or dechlorinated tap water. Never dump live fish or other organisms from one water body into another.